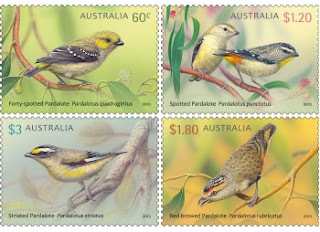 This stamp issue is the fourth in the Australian Birds series. It focuses on pardalotes, a family (Pardalotidae) of foliage-gleaning, mainly insectivorous birds native to Australia and sometimes known as "peep-wrens" or "diamond birds". Unlike wrens, pardalotes do not have the upward-pointing tail. The name "pardalote" derives from the Greek word meaning spotted, as small whitish spots are common to the family, although most particularly to the Spotted Pardalote and Forty-spotted Pardalote. Pardalotes are small, around 8.5cm to 12cm, with short tails and wings, longish legs and thick stubby beaks. Their plumage combines both dull and striking colours. They prefer a eucalypt habitat over anything else - often the high outer foliage - and they play a strong role in controlling lerp infestations (a sap-sucking insect). These monogamous birds usually feed singly or in pairs during the breeding season, darting quickly among the foliage or like small missiles from tree to tree. They often share in the tasks of nest building, egg incubation and rearing the young. Most species nest in horizontal tunnels built into earth banks. Australia Post will release a range of new ‘miniature' artworks on stamps at the World Stamp Expo. One creator of beautiful stamps is renowned Australian wildlife artist Christopher Pope who has illustrated the Pardalotes stamp issue.